It’s the year of the butterfly, and MARIA ROMERO is on a mission to raise awareness of the beautiful monarch through school talks, and teaching people how to create welcoming spaces for butterflies. So much can be learnt from the transformation of the caterpillar into the monarch butterfly by studying and caring for them, and also for children to become conscious of the environment around them. 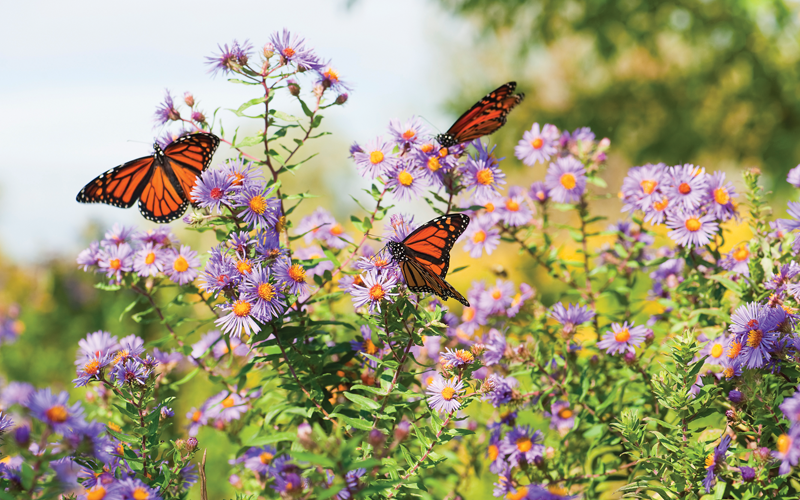 Creating a butterfly garden is the perfect place to start, as it provides nectar and shelter for butterflies and other pollinating insects, and is a place monarchs can lay their eggs. Gardens like these are important for the growth of the monarch butterfly population and are a lovely space to enjoy as well. Monarch butterflies are in decline in New Zealand, so we need to cater to the butterflies as well as the caterpillars, there are two parts to the garden: butterfly attracting and caterpillar nourishment. Butterflies love bright colours. Think red, yellow, orange, pink and purple nectar flowers. To attract monarchs, you will need lots of wild flowers to provide enough nectar for the butterflies to feed off. Plant your swan plants close to your flowers, mixing them up, so the butterflies can be near nectar plants and your caterpillars have shelter. You can buy punnets of flowers at school fairs and garden centres. Once you have a nectar-rich garden, the monarchs will be sure to stop by, feed, and lay eggs on your swan plants. Swan plants are vital for the monarch population to breed. Plant them in a few areas in your garden, as this will prevent disease spreading and keep the aphids at bay. Plan ahead and make sure you have heaps of swan plants, so you never run out. You can grow them from seed indoors from September. If you buy small swan plants in spring, put them to one side and cover them up with netting as these are far too small to go outside. Resist the temptation of exposing small plants to the monarchs and letting them lay eggs. Wait until peak summer, allowing your plants to grow bushy and tall before you use them — you will be truly thankful you did when garden centres have sold out. Once your swan plants have been stripped by the caterpillars, keep on watering and feeding them. Sheep pellets are also good to sprinkle around the base of the plant as this adds nitrogen to the soil and helps boost the leaves, making them grow back quicker — ready for the next generation of monarchs to lay eggs on. Choose swan plants that are sturdy with plenty of leaves. Allow a maximum of four or five eggs on an average sized swan plant to start with (remove the rest), then replace your swan plant with another one just before the plant gets totally eaten. Avoid insecticides and pesticides in your garden because they kill insects. Go organic. Dedicate an area or patch of your lawn where you let the grass grow, and sprinkle wildflower seeds. This will turn into a meadow and is great for the birds too. A pollinator paradise for sure! Watering is best in the morning or evening, as during the day the water will just evaporate and burn the flowering leaves. Also, that way you are helping to conserve water.